Description: OpenSS7 Project Status ISDN Stack. These projects are for components of the OpenSS7 ISDN stack. Each component is tracked under a separate project. Click on any of the components below to see project information relating to the desired component. The ISDN Q.931 Call Control project is to provide an ISDN Q.931 multiplexing driver which provides the ISDN protocol modules. The ISDN Q.933 Frame Relay project is to provide an ISDN Q.933 multiplexing driver that provides Frame Relay protocol modules. The X.213 NSP project is to provide an X.213 multiplexing driver that provides the ISO/OSI Network Services Part protocol modules. 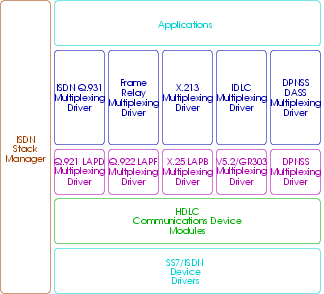 The IDLC project is to provide an IDLC multiplexing driver that provides the V5.2 and GR-303 Call Control protocol modules. The DPNSS/DASS project is to provide a DPNSS/DASS Data Link multiplexing driver that provides DPNSS/DASS Data Link protocol modules. The ISDN Q.921 (LAPD) project is to provide a LAPD Data Link multiplexing driver that provides ISDN LAPD Data Link protocol modules. The ISDN Q.922 (LAPF) project is to provide a LAPF Data Link multiplexing driver that provides the ISDN LAPF Data Link protocol modules. The X.25 (LAPB) project is to provide a LAPB Data Link multiplexing driver that provides the X.25 LAPB Data Link protocol modules. The GR-303 project is to provide a GR-303 Data Link multiplexing driver that provides GR-303 Data Link protocol modules. The DPNSS/DASS project is to provide a DASS multiplexing driver that provides the DPNSS/DASS Call Control protocol modules. The HDLC project is to provide a Soft-HDLC pushable module that provides HDLC Data Link a protocol module. The ISDN Stack Manager is a project to provide configuration and management tools for the OpenSS7 ISDN stack.